I have lived in India now for four and half months and I had yet to travel far beyond the cities of Hyderabad and Bombay before spontaneously leaving over a week ago to join my friend in Ahmedabad. Stephen Keefauver came from Bloomington on the night of the 17th November, flying over a Bombay sky filled with fireworks. After a pretty quick tour of Bombay he headed off to Ahmedabad while I struggled to supply my apartment with working internet. Everything was finally installed on Thursday, so Friday I go to the tourist office in CST train station to buy a last minute ticket to Ahmedabad. Luckily I get on the train that leaves at 8:30pm and gets me to Ahmedabad around 5am. Stephen meets me at the train station and we walk the kilometer and half or so to the Gujarat State Bus Station where we plan on taking a bus to the island of Diu. Stephen had already seen all of Ahmedabad, and I was not severely interested. We take a relaxing breakfast before loading on a bus that would torture us for the next 11 hours. The bus left at 8am and we are told we should arrive around 2pm. Sounds good. Stephen and I find comfortable enough seats by a window that opens all the way, but our knees stick squarely into the plastic backing of the seats in front of us. When the seats in front of us are occupied we find the fellows’ heads right in front of our chins; the seat backs almost completely broken. We are completely trapped and uncomfortable but not the worst off – many are stuck standing. Around 2pm we ask how much longer. “Oh, about 4 hours.” But you said…??? We arrive after 7pm in the most wretched of conditions, tired of being cramped up in that cage. Not only were we cramped, but a group of local boys badgered us the entire 11 hours. Miserable I was. Read more after the break! Lots of Photos! Off of the bus my condition changes almost immediately. According to the map in the Lonely Planet we figure the hotel is maybe a kilometer away, so we walk through most of Diu Village. First thing we notice…it’s quiet. No one is honking! There are very few vehicles on the narrow streets. We wonder around the maze of streets in the dark vaguely following the map in the L.P. and asking directions from strangers on street corners. At last we reach a grand white washed Catholic church illuminated on all side. The main sanctuary they turned into a museum for Diu, but all of the back offices and rooms are now living quarters for a family. We make our way to the roof where we find George D’Souza, the owner of the Sao Tome de Retiro, the guesthouse on top of the church. Our small room costs 300/- a night, so about $3 for each of us. Not the best, but for the views and location…it’s prime. Standing on the pinnacle of the roof between two white towers I can see most of the village of Diu. I can see in the darkness a long pool with several fountains spurting water illuminated on all sides that leads to the steps of the church. In the channel between the mainland and the island a fortress sits in solitude, looking like an abandoned ship; also illuminated nicely. Just before me and to the right is another large Catholic Cathedral, St. Paul’s, the only active church on the island, and beyond that I can see Diu Fort, a massive structure built by the Portuguese. We settle in then go out in search of food and the greatest necessity, internet. I haven’t even seen Diu in the light yet and I love it. While at the cyber cafe a fight breaks out right in front of the large glass doors, a perfect movie screen experience. A large group swells back and forth amongst angry yelling; a large older man streams forward slapping repeatedly the head of a younger guy. The crowd gets involved and everyone appears to be slapping everyone else. (One thing I’ve found here…no one knows how to fight. It’s really comical watching their fights because it’s all slapping and what not. Even in their movies – no, especially in their movies – the fighting is terrible. Their stars throw feminine punches and three guys go flying and so on. They obviously have no idea of fighting techniques and no apparent interest in trying to make it look convincing. This I think effects the society as a whole in their fighting techniques…for better or worse I guess) The skirmish continues as the young man getting the brunt of the slaps get pushed inside the cyber cafe door, bleeding from his eye and his ear, his shirt torn beyond recognition. He struggles to push himself back into the fight and eventually succeeds. The crowd eventually diminishes when I hear the cops approaching. Exciting first night. views from the top of the St. Thomas church. The stairs leading up to the church. After taking a breakfast of pancakes and honey, Stephen and I rent XL something or other motorbikes from another hotel. Driving around the village I note that the brakes are not very good, the speedometer does not work, and the bike stalls any time I idle, whether I’m sitting still or coasting down a hill. We take off across the island, at every intersection choosing which road we think will take us further west. All along, cars are honking at us and guys riding doubles on motorcycles pull up beside us to behold the wonder of two white men on motorbikes. We pass large red brick gates, green fields leading to cliffs that dive into the ocean, and a golden beach covered with visiting Indians. We continue past, trying to get to the fishing village at the end of the island, but on a barren section with golden fields of grass on our right and bare beaches with small crashing blue waves on our right my bike sputters and dies. I think it overheated so I take off my sandals and wade into the cool water for a bit before trying to restart it. We go for another couple hundred meters before it dies again and does not want to restart. We leave the bike leaning against a light pole and go back to the populated beach, both of Stephen’s bike. From a nice hotel we call the “Super Silver Hotel” and they agree to bring me a replacement bike. Larger ships than I expected line the docks that meet the end of the road. The busy-ness of the morning market has all but subsided; workers scrub the bottoms of landed ships clearing them of barnacles; men sit around drinking tea enjoying the afternoon light. The colorful smaller fishing boats I expected to see rest on the north side of the village among sun drying fish hung up like clothes on a drying line. Stephen and I make our way through the narrow streets, dodging cows and kids and other bikes. Several women in passing shops say without much enthusiasm what sounds like “chocolate.” I have no idea what they meant by it. Children run alongside saying “Money?” The paved road disappears and we follow the dirt trail along side multiple shallow lakes, farming something I could not tell (but ooh the smell, that I could tell). The scene is beauty, despite the smell, with something like white egrets launching themselves into the air from the shallow water, announcing our approach to whomever is watching. The oddly shaped house stands in the intersection, enough space for maybe one bedroom on the top floor and kitchen on the bottom, and we decide to explore the incoming road coming from the north. Women in a multitude of colorful wraps and saris stream past us as we continue forward, not knowing what we are entering. A henna haired security guard bids us to park our bikes and follow him into a Hindu temple with screeching female vocals broadcast over an unseen PA system. Several men come and greet us and invite us to take lunch with them. Despite already having eaten lunch – Stephen actually ate three separate dishes – we heartily agree. They take us into a temple and put red powder on our foreheads then lead us to tent full of people sitting lined up on the floor eating rice and dal and chana. Today is this god’s birthday so they are celebrating with a community meal. We stuff ourselves then sit around talking with the men about what we do. After some time the man showing us around asks, “Have you seen the prawn farms yet?” – why, no we haven’t. He leads us beyond the temple into a series of man made salt-water lakes that border the sea. In each lake turbines churn the water keeping it aerated. We are led to a hut with men working with nets overlooking one of the ponds. They throw in a net and pull out around 20 or so Tiger Prawns, creatures bigger than my hands. 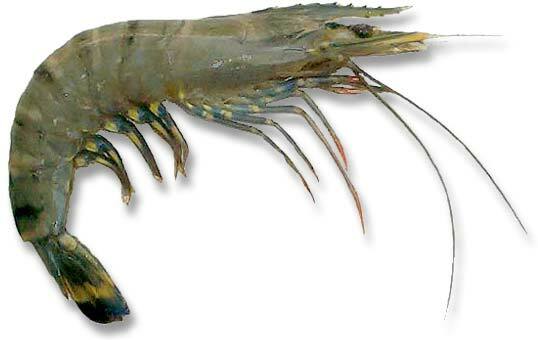 All this time I thought prawns were shrimp, but they are some how different. We learned a lot about prawns. They kept talking about prawns. They told us probably 15 times these were prawn farms, they just kept saying the word prawns. I didn’t know you could say prawn so many times. One guy read Stephen the back of the feed bag for the prawns, told him about mixing ratios and everything he never wanted to know. But it was entertaining nonetheless. The road ends with several women telling us we have to turn around, this street does not go all the way through. We have to go back to the fishing village to get to the road that crosses the island on the south side. On our return journey we come across these colorful structures that from a distance look like miniature houses populating a hill looking over the beach. As we get closer we realize we’ve come across a Hindu cemetery. Little cement ‘houses’ painted in bright colors line the hillside in neat little blocks. I was hoping it would be a little bit more interesting. The Kalpana distillery eluded us. Where the map said it was there is nothing but a petrol storage area. We just wanted to find where they make their local alcohol. We search around for a bit then head back towards Diu. We try to take roads we haven’t been on before till we find something exciting to do and come across a sign for ‘Caves’, so we decide to check it out. They are a mixture of natural and man-made caves carved into the sandstone cliffs. It is apparent they were used for some kind of ritual of some sort. Hand and footholds are carved into over hanging and vertical rocks meaning someone was climbing these cliffs, but I cannot see to what purpose. I caught the sun set at Sunset point. I climbed down from the path to walk among the tidepools and watch the sund dip below the distant horizon. The steps leading up to the roof at St. Thomas Church. I meant to wake up around sunrise to go take pictures of the fishing village in its busiest hour, but I’ll just let you know…I missed that. Stephen and I take our lunch then mess around sliding our bikes in gravel and making general havoc. We had not gone out expecting to go anywhere else; Stephen in shower sandals and I naked without my camera. We search Diu for a better place to practice sliding stops and end up taking off across the island again, unsure of destination. The drive through the innards of Diu village reminds me in many ways of the tight, winding streets of Italy and I am sure they are reminiscent of someplace in Portugal, differentiated only by the random Brahman cow blocking the road. We come to an intersection with a giant gate in one direction signifying the entrance to Diu Island. The temptation of crossing the unknown and seeing the mystery of the main is too great. We cross the one lane bridge and get waved past a police checkpoint by a very jolly policeman (checking for alcohol since the State of Gujarat is a dry state and Diu is an island of drunken paradise). The desert surrounds us, accentuated by a pack of roving camels. The land is utterly flat with no apparent change in elevation by even a few meters. We take the paved road that heads in the direction we determine we should be traveling to get to the other bridge that leads back to Diu, but soon the draw of leaving the easy road to bump along interweaving dirt paths created by herds of cattle and camels is too great. Stephen and I fly on, enjoying the freedom of life without roads provides, and occasionally sliding to a stop in a cloud of dust…because we can. Eventually even the dirt paths give up on us and force us back to the main road, which we have to take with much greater caution because of the ginormous man-eating potholes. We pass through small village after small village receiving the inhabitants’ stares with appreciative waves and smiles. In each village the women are dressed differently with different colors and patterns, with village specific nose and ear jewelry and tattoos covering arms and neck. At this point I hate that I did not bring my camera along, but I recognize had I taken pictures of everything I wanted to this half-day drive would have taken roughly three days. The teenage girl standing in the middle of the desert fighting against the wind to tie her flowing red dress; the beautifully wrinkled faces and tattooed bodies of the women staring as we drive past; the kids dropping everything they are doing out in a field and running full speed away from us at first site then turning and waving. Stephen starts complaining about something rattling uncontrollably on his bike and we stop to look and find nothing obvious, but as soon as we start again the cause of that uncontrollable shaking becomes so very apparent. I laugh as he false starts only to come violently to a halt, and I tell him his chain is dragging on the ground. We try our best to reattach the chain, but with the guard in place we find it impossible. We sit there, not sure what to do surrounded by nothing but desert and a few trees. Several motorcycles pass us, some single riders I try to flag but all just fly by. A young man on a bicycle named Rumesh stops and tries to help but doesn’t succeed in bettering our efforts. I take him on my motorbike into the closest thing resembling a village where he grabs some tools and we go back to Stephen. With the tools we’re able to take of the chain guards and reattach the chain to the gear, and Rumesh refuses any kind of compensation and peddles off just as he came. Stephen and I take it a bit more slowly since the chain is still loose, and without incident we make it back across the bridge leading into Diu. Relaxing and taking in the beautiful sunset from the top of the church, Stephen and I wait for the famous fish barbeque George makes every other night. The tuna and shark steaks taste spectacular, complimented by the calamari pasta. Stephen takes his bike back to the Super Silver hotel to try and get a replacement. It won’t start with the kick-start so he takes off pushing the bike. I want to take a drive then go find internet so I jump on my bike, with a powerful kick the engine roars to life and I take off down the hill, my back end swerving uncontrollably. My rear tire is completely flat. I figure the hotel will try and charge me for the tire so I walk the bike a kilometer or so to a petrol pump, conveniently finding it closed. I ask around and since its after 9pm, I can’t get any help till the morning. I walk the bike uphill back to the hotel and they inform me they won’t replace the tire or the bike…I can pick it up at 9 in the morning, even though I only have it through 10am. Both Stephen’s and my bike are out of commission. This is disappointment since I was planning on going to the fishing village at the end of the island early in the morning to catch the morning activities at the fishery. George’s brother rents me another TVS XL and I take off across the island in the morning light, enjoying the wind in my face and the cool breeze. The fishing yard is a buzz with activity – ships unloading their fresh catch into motorcycle rickshaws, workers scrubbing barnacles off of beached ships, and boats getting necessary repairs. I am frustrated here, feeling that I do not capture what I am seeing; something I felt repeatedly in all of Diu. It is such a spectacularly calming and beautiful place. I wasn’t doing the portraits I so love doing and wasn’t capturing the scenery as well. Stephen and I catch a nice breakfast, check out and try to catch a bus to Una to get the 2:30 train to Junagadh. We end up riding in a overstuffed motorcycle rickshaw, the Royal Enfield engine struggling to pull the weight up even a miniature hill. Stephen is stuck inside, constantly being interrogated in Gujarati and not understanding a thing. I had the advantage of riding standing on the tailgate and holding onto the luggage rack alongside a long gray bearded Muslim man. We find our way to the train station in Una and buy our tickets. 23/- for a 155km trip. This trip should have taken two to three hours at the most, but we spent seven hours on board the overstuffed no reservation train. We start out in the luggage compartment squished like sardines, everyone slowly shifting to the right and left, move this foot and that arm, so most everyone can somehow find a way to sit down. I break out my camera and my co-inhabitants mostly enjoy getting their pictures taken. We decide after the sun cools off a bit we will move up to the roof of the train, which in reason has to be less crowded than this compartment. About 4:30 we climb up between the cars using pipes and bolts to lift ourselves, only to find the roof almost just as packed as the inside, but the young guys up there shift around so we have room to sit. This…this was a good decision. The views were spectacular and the company entertaining. The fresh air is much preferred to the stuffy, sweaty insides. As the sun sets and dark sets in we get a magnificent view of the stars. We chug into Junagadh amongst a constant back and forth jeering between those on the roof of the train and those watching the train go by. It’s quite entertaining and I am encouraged to yell at every crowded intersection. At the train station we find we cannot get a train directly to Bhuj and we should try to take an overnight bus. Several of them leave in an hour so I we hurry to the bus depot only to find all of the A/C Sleeper coaches full so we resort to enduring another state bus experience. I came across your blog for the first time today. I am amazed by your skill and vision.